Our spacious, resort sites include water, sewer, 50 amp electric service and paved roads. 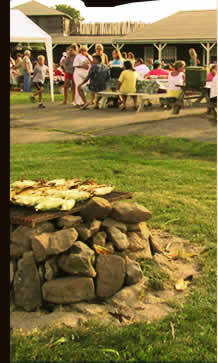 We offer seasonal sites or open area tent and RV camping. The fort complex is a full-scale replica of an early 1800s-style frontier fort. Within the complex you will find a restaurant, shops, weekend flea market and a stage for bands and other activities. Seasonal and overnight campers can enjoy a scenic walk along West Harbor, fishing, a round of putt putt or just lounging by the swimming pool. Boat storage, a playground, modern restrooms, hot showers and laundromat all contribute to making Fort Firelands RV Resort one of the best spots for family camping in northern Ohio!